Historically, at the time of the Exodus and conquest, 1406 BC, Madaba and Mt. Nebo were part of the territory of Moab. Isa 15:2; Num 36:1; Deut 32:49. 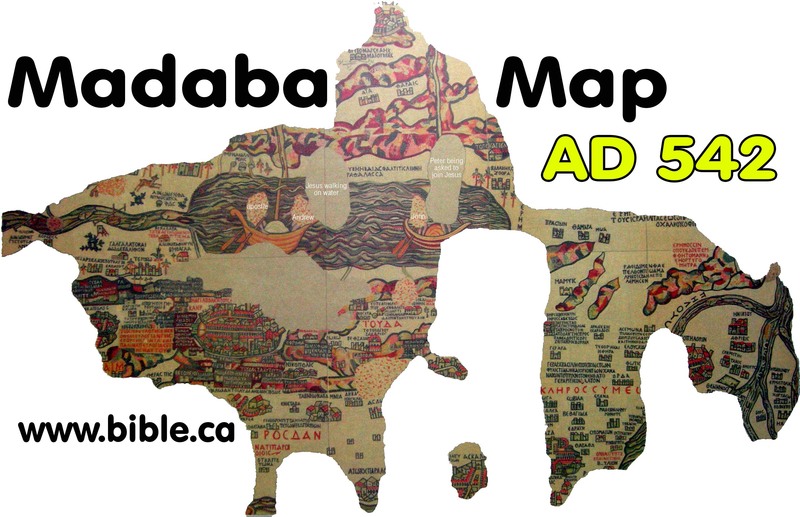 In 542 AD, the Madaba Map was finished. It is a large mosaic floor about 20 feet wide in Madaba, Jordan. In 622 AD, the Muslims slit the throats of most of the Christians living from Egypt to Constantinople, including the promised land and the city of Madaba, Jordan. The dark ages of Islam had begun. Christians have been murdered at Muslim hands ever since. About 700 AD the Muslims under the Umayyad Dynasty, were offended by the fact that the mosaic portrays Jesus as God's Son and that Jesus is seen walking on water and asking Peter to get out of the fishing boat to join him. So, like their modern Muslim archeological counterparts who excavate the Temple mount with a bull dozer and grind 2000 year old artifacts into gravel for the roads, they defaced the mosaic where it shows Islam to be an apostate religion. (i.e. Jesus is the Son of God) Of course it is odd that this event is portrayed on the Dead Sea where no one fished, especially since the actual story happened in the Sea of Galilee. But this is a devotional map for worship. 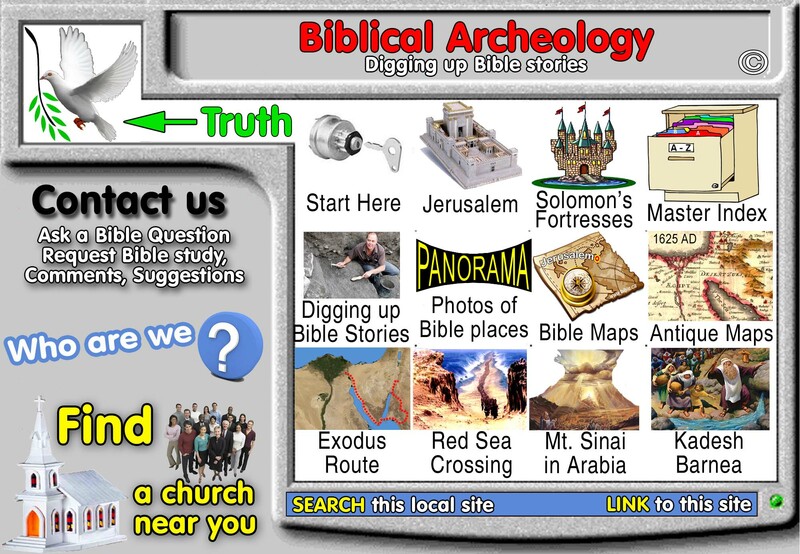 The map is famous because it is one of the oldest maps of Bible lands in the world. The Madaba map, is was clearly based upon the "Onomasticon" written by Eusebius in 325 AD, even though it differs at times from it. In 1894 AD, the Madaba map was rediscovered and is currently under the protection of the Orthodox church, who rebuilt a church over the mosaic in modern times. The map is currently in St. George's Orthodox church. 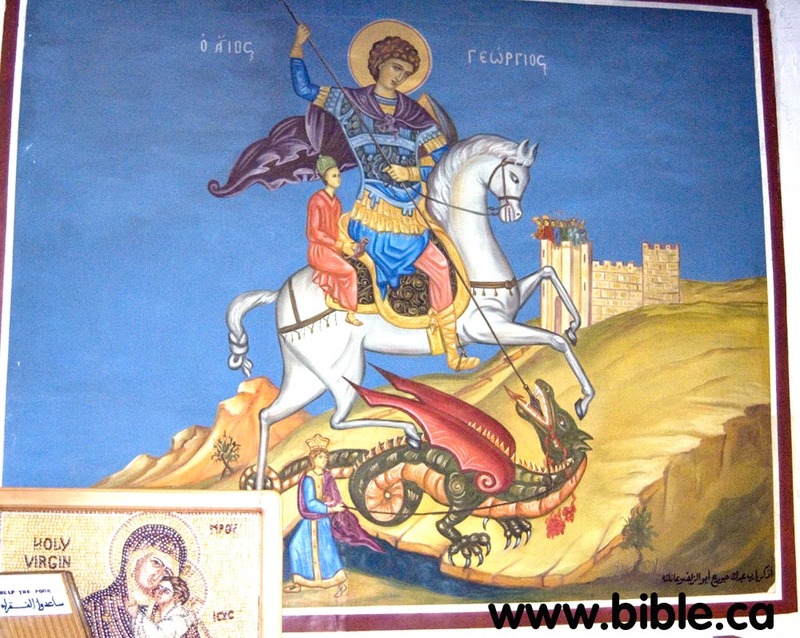 This is the church that celebrates the story of St. George slaying a dragon. This photo is of an 500 year old painting in the church of the event. Of course, this gives evidence of dinosaurs and humans co-existing. Ancient church buildings were oriented 180 degrees from the Temple in Jerusalem. The Holy of Holies was entered from the East with the ark of the covenant in the west. Byzantine church buildings were entered from the west with the "altar" in the east. 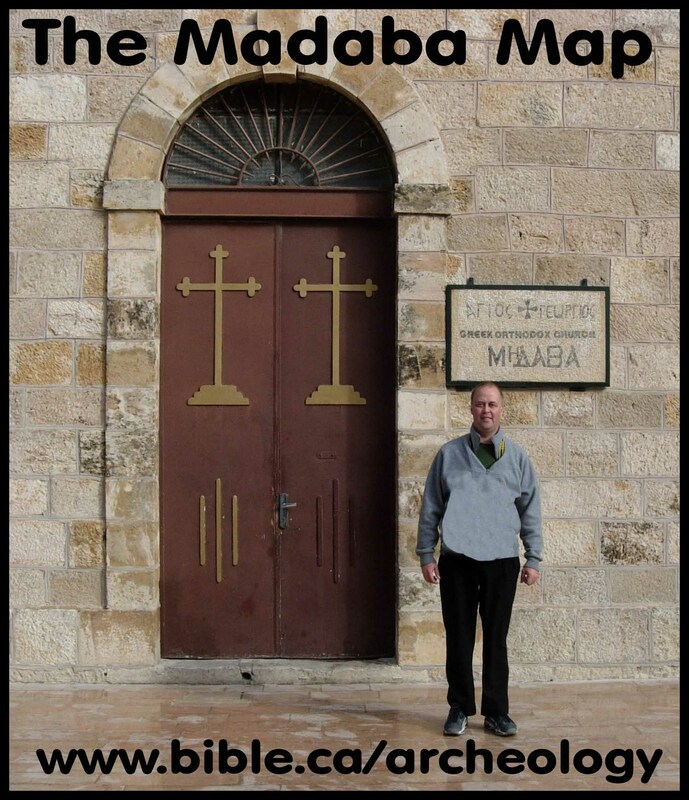 Therefore the Madaba map is oriented so that those sitting in the pews can look ahead to see the map, then look beyond the map and see the pulpit or "Altar". The map is read from the west. The Madaba map is not to scale. Jerusalem is greatly enlarged and distances are greatly distorted to what we would expect from a the map. But the map was for devotional purposes, not science and geography as we would like it to have been from a modern perspective. When they built the map, one 1/2 inch cube of stone mosaic as a time, they likely never realized they were working on what would be the most important ancient map in existence. The sea port for where the Wadi el-Arish empties into the Mediterranean sea is called el-Arish. The port of Arish is also called Tharu and Rhinocolura. These three names refer to the same place. Rhinocolura gets its name from the fact it was a prison city for criminals of Egypt whom the Pharaoh would literally cut off their noses "Rhino-colura" and force them to live in this sea port on the far edge of Egyptian territory. Arish has been the western border of Egypt since 2000 BC. Between the towns of Bitylium and Rhinocolura are the following red words in the Madaba Map: Border of Egypt and Palestine "Horoi Aigyptou kai Paleaistines". One of the most important things the Madaba map shows is that the border of Egypt was at the Wadi al-Arish. This is the historic border between Egypt and Israel from 1446 BC, the time of the exodus , to 70 AD, when Israel was destroyed. In modern times the border has been moved 44 km north east to Raphia at the eastern edge of the Gaza Strip. 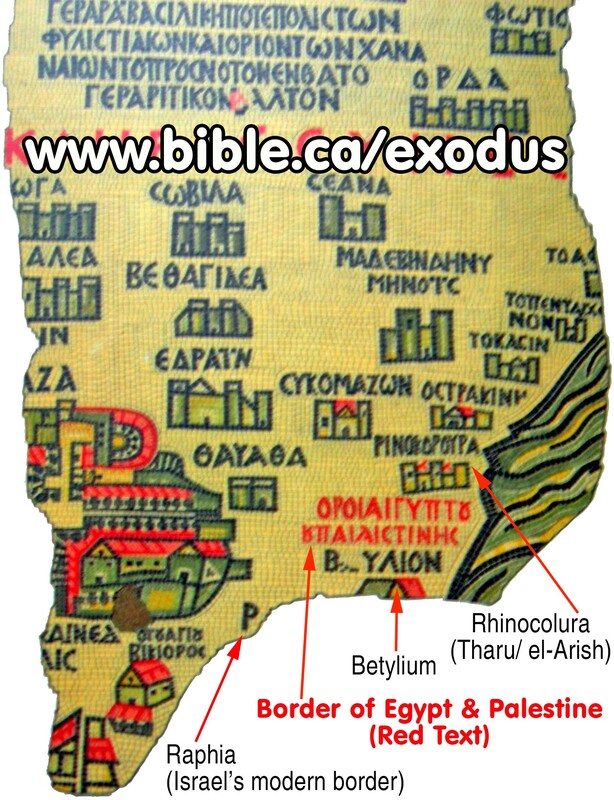 You can see from the Madaba map that the border is between Bitylium and Rhinoculura (Arish). The Bible clearly shows that the border between Egypt and Israel was just north of the Wadi al-Arish: Genesis 15:18; Joshua 15:4,47. The Wadi al-Arish is the southern/eastern border of the promised land. Missing entirely from the Madaba Map is the Red Sea, Mt. Sinai and Petra/Kadesh Barnea. It would certainly be on the map, but was vandalized by the Muslims in 700 AD. Since we know these locations would be on the map, they must have been the primary targets of defacement. Most notably, however, is that the modern choice for the location of Kadesh Barnea at Ein el-Qudeirat, should be in a section of the map that is fully intact. Qudeirat should be located close to the large red text, "lot of Simeon". Petra is not on the Madaba map and it most certainly would have been. Petra is where Eusebius located Kadesh Barnea, the Mt. Hor, the rock Moses struck, the place Miriam died. It would have been located in a section that is missing. We would expect it to be directly above Praesidium, Thamara, Moa and above and to the left of "The desert where the Serpent of brass saved the Israelites". Kadesh Barnea, if located at Qudeirat, as most today wrongly believe, should be located on the map in a section that is not damaged. It is not located there. No where on the Madaba map is Kadesh Barnea located. However, if it was, there is absolute certainly that the church from the time of Christ down to 600 AD believed Kadesh Barnea was located at Petra. To complicate matters, it is well documented that geographers from the time of Herodotus (450 BC) right up to the 17th century AD, had almost no concept of the Gulf of Aqaba. The Madaba map, in fact, looks exactly like the map of Herodotus below. Even Strabo in 15 AD , on the other hand, correctly understood the Gulf of Aqaba. 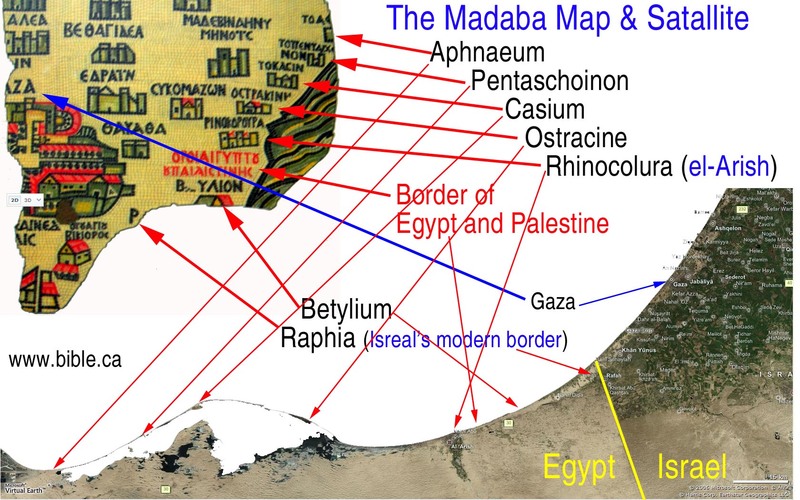 Compare the map of Herodotus with the Madaba map as they are based upon the same common misunderstanding of the "V" shaped Red Sea that branches into the Gulf of Suez and the Gulf of Aqaba. It is truly sad that this portion of the Madaba map is missing that shows Mt. Sinai and the shape of the Red Sea. We must keep in mind that in 545 AD, the prevailing view of the Western/Latin church (Rome/Roman Catholic) was that Mt. Sinai was located at Mt. Musa in the modern Sinai peninsula. The Madaba Map is located deep into Eastern/Greek (Constantinople/Orthodox) territory of the church. It is entirely possible that there was a rift between east and west as to the real location of Mt. Sinai. Perhaps the Madaba map located Mt. Sinai on the eastern side of the Gulf of Suez. All this is speculation of course. On the other hand, with their misunderstanding of the existence of the Gulf of Aqaba, it may have been mapped the same way on the Madaba map even if it was located in the traditional location west of the Gulf of Aqaba, or where the Bible says it is: in Saudi Arabia (Gal 4:25) on the east side of the Gulf of Aqaba. Two little letters "ME" on the top of the Madaba map just right of Zered Wadi, simply cannot be Kadesh Barnea. Both Eusebius and Jerome believed Kadesh was at Petra. Petra was such a major center that many of their references were based upon distances from Petra/Kadesh. Some translated maps of the Madaba map show the Wilderness of Sin as the Wilderness of Zin. These are two very different places and wildernesses. The wilderness of Sin is when Israel got the Sabbath revealed for the first time. it is also the place they first got Manna and also quail for food. (Ex 16:13) The wilderness of Zin is north of Kadesh, but includes Kadesh. (Num 27:14) Zin is transjordan and north of Petra in Modern Jordan. Twice during the Exodus God gave Israel quail. First at Sin and second at Kibroth-hattaavah (Num 11:34) and is one stop after Mt. Sinai. 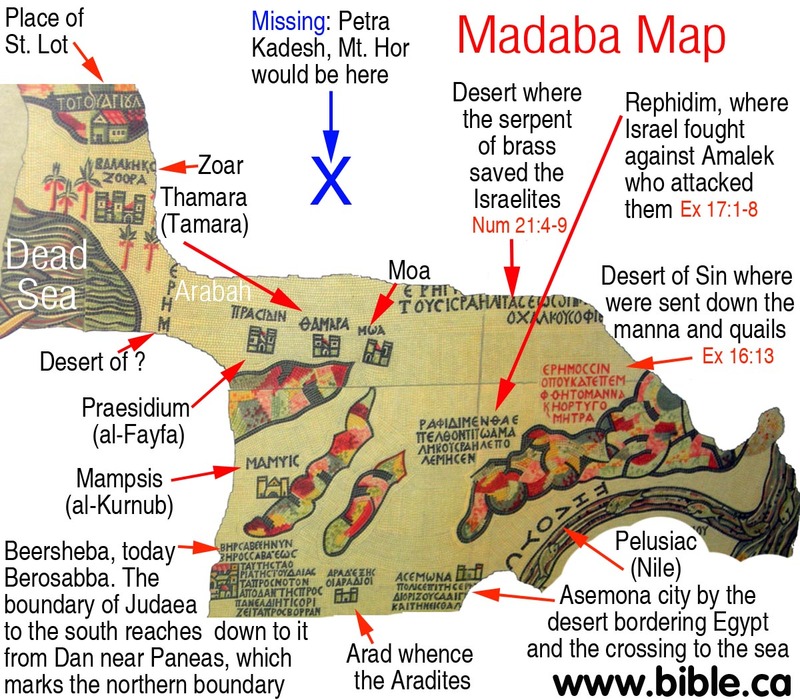 (Num 33:16) Therefore the Madaba map says, "Wilderness of Zin: The desert where the Serpent of brass saved the Israelites", it translated incorrectly and should be the Wilderness of Sin. We are certain that the makers of the map knew the difference. Of course if it was the wilderness of Zin, that would directly locate Kadesh Barnea, but then we would not make sense of it because the story of the Manna and quails did not happen there. So it is the wilderness of Sin before Sinai, not Zin at Kadesh. Petra is not on the Madaba map. It would have been located in a section that is missing. We would expect it to be directly above Praesidium, Thamara, Moa and above and to the left of "The desert where the Serpent of brass saved the Israelites". (see below). 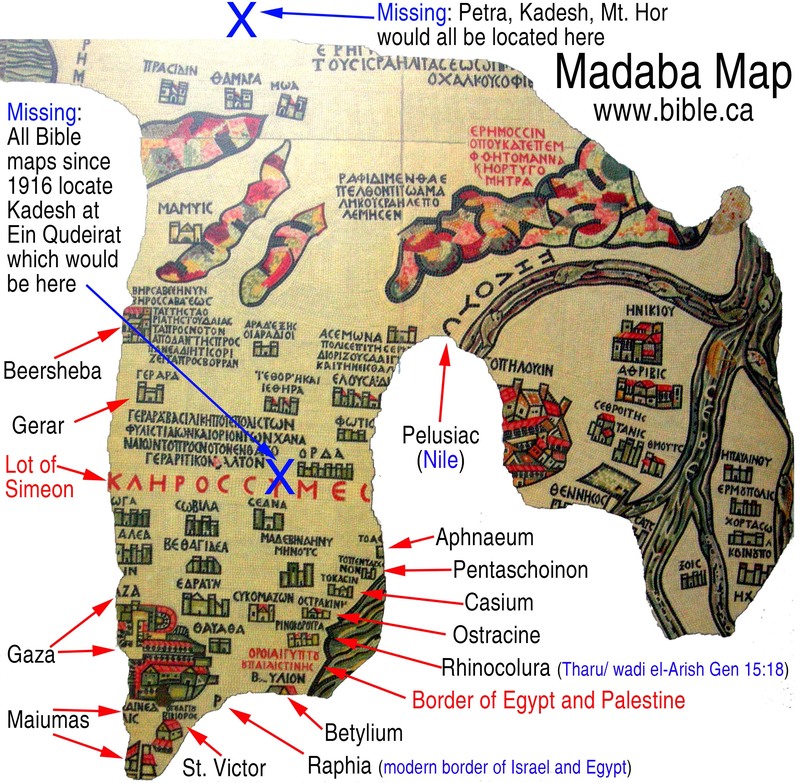 The placement of the Wilderness of Sin and Rephidim on the Madaba map is a problem for those who place Mt. Sinai in the mountainous area directly below both. We believe that Mt. Sinai, if it was on the map, would in the missing section at the right of this mountain range. Both the "Desert of Sin where were sent down the manna and the quails" (Ex 16:13) AND "Rephidim, where Israel fought against Amalek who attacked them" (Ex 17:1-8) is a problem for those who believe Mt. Sinai is located in the mountain range directly below this text. This mountain range, they believe, represents the modern Sinai mountain range where Mt. Musa is located. The problem is that Israel entered the wilderness of Sin and Rephidim BEFORE they reached Mt. Sinai not after. But even if Mt. Sinai was located on the other side of this Mt. range the order is still reversed: The map has them entering Rephidim first, then the wilderness of Sin second, then Mt. Sinai, so even the sequential order is backwards in addition to the major distortions of distance typical of this kind of "devotional map". Then we need to figure out how the section of the map that says, "desert where the serpent of brass saved the Israelites" fits into all this. We know that this event happened east of Kadesh/Petra. This means we would expect to find Petra somewhere directly below this text that highlights the events of Num 21:4-9. 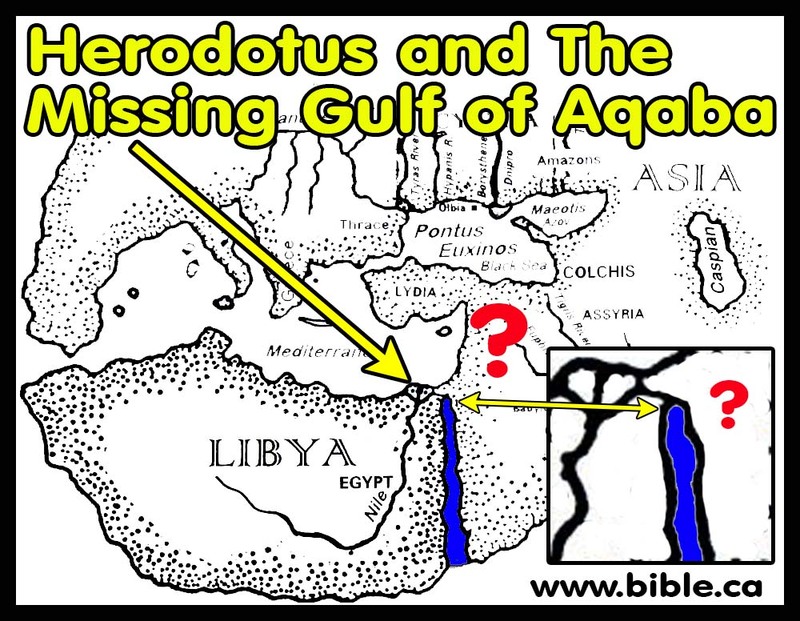 What we do learn from all this, is that their understanding of the Gulf of Aqaba was as bad as their understanding of the Bible geography as the scriptures revealed. The fort at Zoar is exactly where we would expect to find it: just above the right end of the Dead sea. The series of three forts directly to the right of the Dead sea are known locations. First is Praesidium thought to be at al-Fayfa. Second is Thamara is mentioned in the Onomasticon and is located at Tamara. The third is Moa, perhaps located at near Nahal 'Omer. Tamara: For a full discussion of Tamara/Thamara, see: Tamar. Tamara: Eusebius says in the Onomasticon: "Asasan Thamar (Asasonthamar). Where the Amorrites dwelled whom Chodollagomor destroyed is located near the wilderness of Cades. It is said there is a village Tharmara (a fort Thamara) one day journey from Mapsis on the road from Hebron to Ailam. [Elat on the Red Sea, see Ailam] Today there is a garrison (Roman fort) of soldiers there." Footnote #: 8: Asasan Thamar (Asasonthamar). Genesis 14:7; K. 8:6; L. 234:84. On the Madaba Map there is a Thamara located as suggested by Eusebius here. Tabula Peutinger has a Thamaro 52 or 53 miles from Jerusalem while Ptolemy's list (V, 15, 5f) has a Thamaro about 55 miles distant. The Notitia Dignitatum (74:40) has a Tarba and (74:46) a Thamarra both of which have a garrison. Alt found a fort at Qasr el Juheiniye and he is followed by many locating the fort there and the village at 'ain el 'Arus. Aharoni more recently (TEJ, 1963, p.30ff) suggests 'Ain Husb which is about a day's walk (32 km) from Kurnub which is generally identified with Mapsis (cf. also Avi-Yonah) and has a large Roman fort as well as Nabatean and Iron II sherds. The Madaba Map using Jerome's spelling has located properly Mampsis. Many Nabatean, Roman-Byzantine levels excavated at Kuroub. It shows a revival in the fourth century A.D. as also does Oboda (Avdat, 'Abda, and K. 176:9).This may be indicated by "village" in Greek and "oppidum" in Latin (cf. K. 10:25). II Chronicles 20:2 identified Thamar with En Gedi or at least locates it in the district of En Gedi (86:16). Jerome in Hebrew Questions says, "his city which we now call Engaddi, is rich in balsam and palms since Asason Thamar translated into our language is city of the palms'" (18) (cf. Judges 1: 16, Ezekiel 47: 29). E. The exodus route: Shechem (Nabulus) Mt. Gerizim and Mt. Ebal. 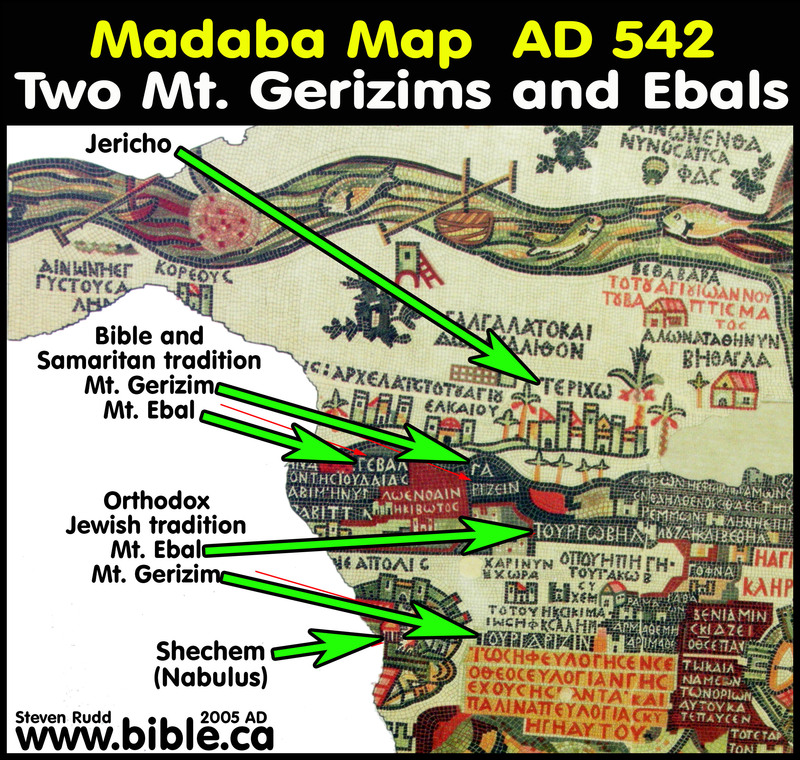 The Madaba map places the two mountains twice, in two different locations: On the Madaba map, the mountains of Ebal and Gerizim are in two different locations. One is at Shechem (Modern Nabulus) and one near Jericho and Gilgal. This is because the Orthodox Jews had created a new location near Jericho in their longstanding dispute with the Samaritans. Eusebius, Jerome and the creators of the Madaba map were fully aware of the two traditions and chose to represent both on the map. Here is a detailed study of the Samaritans and why they chose Mt. Gerizim as "their Jerusalem".